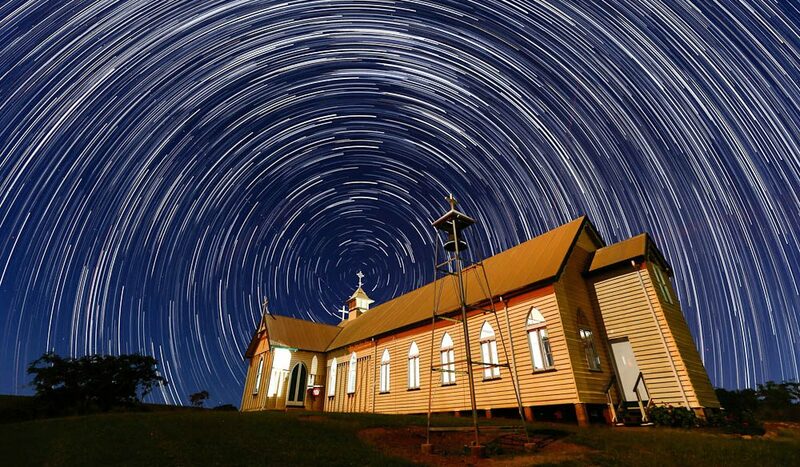 Star trails at Ravenswood Church, QLD (by Cameron Laird). Ravenswood in Queensland is an historic town founded on the gold boom of the late 1800s. I was out there to shoot ‘star trails’ – a combination of hundreds of individual photos. One of the most critical factors is the need for a dark sky, so getting at least 100 kilometres from a city is important. The first image I took was of the church (30 seconds at f/4.5 at 100 ISO) and then I waited a couple of hours to take just over 200 photos of the sky, one after the other (30 seconds at f/5.0 at 1000 ISO) to create this final image. The camera was a Canon 5DMkIII with a Canon EF 16-35 f/2.8L MkII. Want your photo to be published? Send us the best Australian travel image you’ve ever captured for your chance to win a great prize.In the first instance, email a low-res pic to: photo@australiantraveller.com. Our winner for each issue receives a major prize. Each runner-up receives a $100 gift voucher from Australia’s first and finest photobook maker, Momento. Relive your travel adventures every day in a premium coffee-table book that you design using Momento’s free software, before they print and handcraft it for you with tender loving care.